I was getting new AVON tires and was quite excited! I called up Bill and Susan Dragoo and asked if I could send them to their house and were they up for a visit – I was invited in and Bill even let me know that he had a shop I could use as well. When I arrived my ETD (estimated time of departure) had changed from just a couple days to being able to spend 5 days with the Dragoo’s! It turned out to be not just an amazing visit with them both but much needed love to Amelia as well. Our days started out with tea and bananas and then off to the gym for about an hour (except one day Susan took me on a beautiful trail run through Sutton Wilderness, we opted out of indoor treadmill time). Then we would return home and have a great nutrient packed breakfast and Bill and I would head into the shop to work on Amelia…. Well here is the “Bill factor” – and he is so patient to allow the extra work and take the time to really work through it all with me! We started off with the idea of just doing tires and oil change– then with Bill’s keen eye Amelia showed her true colors as she knew she was in good hands…what started as a one day quick job – turned into a call to #TruimphAmerica and a gracious overnight box containing the much needed steering head components to replace the bearings to fix a detent, rear rotor, new brake pads, and all the lock tight bolts for the rotor (big thank you to Triumph North America for the support)! Then it came time to do the work I had planned – putting on the new AVON tires! I am grateful to Craig from the Freedom Cycles in Las Vegas as he had nothing but great things to say about the quality – I am definitely excited to put the rubber to the road and test them out! 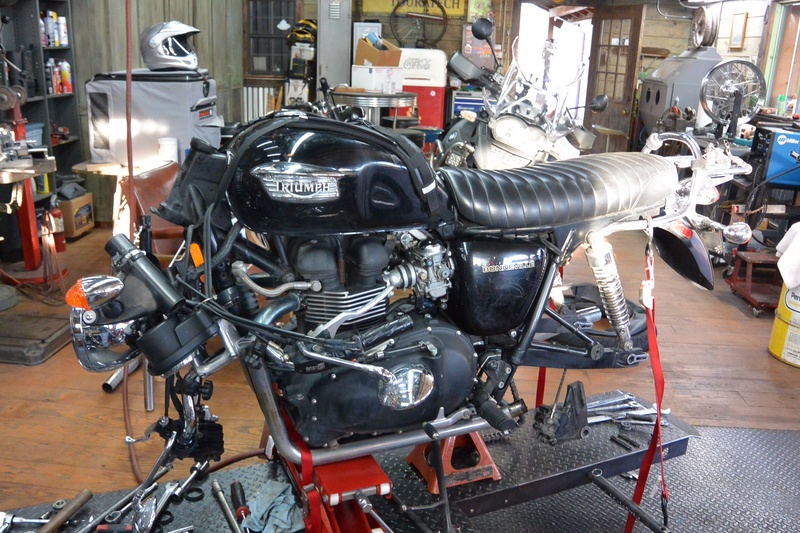 I was also able to head out to Oklahoma City and visit with a new Triumph certified Dealer and thank you to them for the support of oil and filter – AC the owner is a very kind guy! So the “Bill factor” taught me lots about Amelia and caught so much that needed to be done, what is the “Bill factor” well to me the -“Bill Factor” is an open heart, genuine spirit and all around wonderful person and the “Bill factor” is in both Susan and Bill – amazing hearts! I have been blessed to spend a week with such souls! From bike work to gym time, to evening wrap up in relaxation watching a TV program with wine, to the meals and the gun range- it was a wonderful time! Great post! Yes, we are always at the mercy, kindness of friends… Makes the heart sing. Thought you may get a kick out of this picture of our Bullet Sport . Looking forward to your visit! Claude at Freedom Sidecars…Middleburg,Pa. check fb. Danell, thank you for such kind words. It has been a great pleasure to get to know you and welcome you into our home. We look forward to many years of an enduring friendship! It was a pleasure to meet you while you visited Norman. Bill and Susan are a power couple here in Norman who put their strong Christian faith in to action every day. They are always up to some new adventure and do a great job of photographing it and writing about it. You were in great hands with their considerable talents! I was a glad to have ride with you guys was great fun! Danell when will you be in Chicago I’d like to show you around. I ride a 98 Triumph and have a bunch of other Triumph riders that would love to meet you and hear about your trip. Would love to! Thank you – not sure exactly when I will be that way – for sure after May 17th as time gets closer will keep you posted! Sounds like a lot of fun, thank you. It was a pleasure to get to know you while you were in Norman! Best wishes in your future travels!